To help your user understand the purpose of your custom functions in Excel 2019, you can add descriptions that appear in Insert Function and Function Arguments dialog boxes that help explain what the function does. To add this kind of description to your user-defined function, you use the Object Browser, a special window in the Visual Basic Editor that enables you to get information about particular objects available to the project that you have open. Open the Visual Basic Editor from Excel by clicking the Visual Basic button on the Developer tab of the Ribbon or pressing Alt+LV or Alt+F11. Now, you need to open the Object Browser. Choose View→Object Browser from the Visual Basic Editor menu bar or press F2. This action opens the Object Browser window, which obscures the Code window. Click the drop-down list box that currently contains the value <All Libraries> and then select VBAProject from the drop-down list. When you select VBAProject from this drop-down list, the Object Browser then displays your user-defined function as one of the objects in one of the Classes in the pane on the left. Right-click the name of your user-defined function. This action selects the function and displays it in the Members pane on the right, while at the same time displaying the object’s shortcut menu. Click Properties on the shortcut menu. 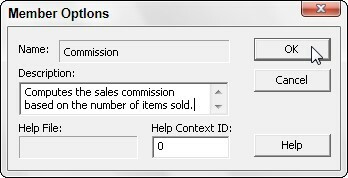 This action opens the Member Options dialog box for your user-defined function, where you can enter your description of this function, as shown in the figure. Type the text that you want to appear in the Insert Function and Function Arguments dialog box for the user-defined function in the Description text box and then click OK.
Now, you can close the Object Browser and save your changes. Click the Close Window button to close the Object Browser and then choose the File→Save command.